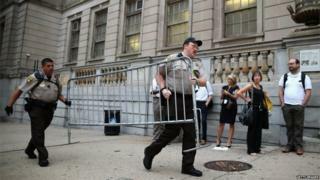 A US judge has ruled that six Baltimore police officers accused of causing the death of a man in their custody will stand trial separately. Baltimore Circuit Judge Barry Williams said that trying the officers as a group would not be "in the interest of justice". Freddie Gray, 25, died after sustaining a severe spinal cord injury while riding in a police van in April. His death sparked nights of unrest and weeks of protests in the city. Defence lawyers initially sought to have the charges dropped, but Judge Williams denied that request. Judge Williams also rejected a motion to have the prosecutor removed from the case at a pre-trial hearing on Wednesday. Defence lawyers argued misconduct by state prosecutor Marilyn Mosby, and wanted an independent prosecutor to handle the case. They say Ms Mosby violated her obligation to a fair trial by announcing the charges at a public news conference as protests over Freddie Gray's death were already in motion. Judge Williams called Mosby's public comments about the case "troubling" but said they were not likely to prejudice a jury. Dates for the trials have not yet been set. Gray's death, which was ruled a homicide, is one of several involving black Americans and police officers which has sparked unrest and national debate over police and race relations. The officers pleaded not guilty to the charges, which range from false imprisonment to involuntary manslaughter. Gray was arrested on 12 April after a police chase on foot in West Baltimore. He sustained a severe spinal injury while being transported in a police van. Police later admitted he had not been secured by a seatbelt and his request for medical attention at the time was denied. He fell into a coma and died a week later. His death sparked protests over police brutality, with the city of Baltimore erupting in rioting, looting and arson on the day of his funeral. Questions over whether the trial should be moved from Baltimore will be raised at a second pre-trial hearing in September.